We’d love your help. Let us know what’s wrong with this preview of Too Loved to Be Lost by Debora M. Coty. To ask other readers questions about Too Loved to Be Lost, please sign up. I really appreciate Debora M. Coty's refreshingly honest way of writing so I was looking forward to Too Loved to Be Lost. It's so nice to read real thoughts from someone who has no problem admitting her own shortcomings and desire to do better. A real, honest woman is someone I can relate to! This book could be called a devotional since it's broken down in short chapters, one for each day. They are longer than some of the devotions I've read lately but it's nice to dive a little deeper. I like th I really appreciate Debora M. Coty's refreshingly honest way of writing so I was looking forward to Too Loved to Be Lost. It's so nice to read real thoughts from someone who has no problem admitting her own shortcomings and desire to do better. A real, honest woman is someone I can relate to! This book could be called a devotional since it's broken down in short chapters, one for each day. They are longer than some of the devotions I've read lately but it's nice to dive a little deeper. I like that she starts off with a story from her own life. It makes her relatable and trust me, you will relate to her stories! Then she goes into what she learned from them and lastly, questions to help you apply to your own life. This is the area that you will dig deep within yourself and if you are honest in your responses, really have an opportunity for some real growth and character development. I also love her sense of humor. Laughter really is the best medicine! She's a bit sarcastic and witty and that is definitely my kind of humor! There's nothing like a little comic relief to balance out the serious moments. You might find yourself tearing up over something that particularly touched you, only to be laughing at a silly statement a minute later. It's a perfect balance of both. While appearances certainly aren't everything, this is a very cheerful looking book! You can see from the cover that it's bright and colorful with fun fonts and the inside is no different. There is something about reading a bright green font that just makes you feel happy! In a book designed to life you up, I liked this detour from the ordinary black and white print I read all day, every day! Too Loved to be Lost is a refreshing, uplifting read that I couldn't help but love. What an encouraging book. Combining personal stories and anecdotes with witty writing, Coty gives us nuggets of truth and wisdom wrapped in humor. She gives encouragement on topics like burnout, depression, brokenness, discernment, and many more. The chapters are pretty short so this could be used as a devotional. There are questions for reflection or use in a trusted group. I recommend it. See my complete review at http://bitly.com/1t9Z1gB. I received a complimentary egalley of this book through What an encouraging book. Combining personal stories and anecdotes with witty writing, Coty gives us nuggets of truth and wisdom wrapped in humor. She gives encouragement on topics like burnout, depression, brokenness, discernment, and many more. The chapters are pretty short so this could be used as a devotional. There are questions for reflection or use in a trusted group. I recommend it. Debora M. Coty in her new book, “Too Loved to Be Lost” published by Barbour Publishing, Inc. gives Discovering God’s Intentional, Unconditional, Without-Limits Love. From the back cover: Get on a heart level with the One who sees you through eyes of affection, not criticism. The One who isn’t fixated on a list of do’s and don’ts, but with the condition of your heart. Papa God’s love is never too lost…or too late. With her own brand of off-beat wit and near-wisdom, inspirational humorist Debra Coty a Debora M. Coty in her new book, “Too Loved to Be Lost” published by Barbour Publishing, Inc. gives Discovering God’s Intentional, Unconditional, Without-Limits Love. With her own brand of off-beat wit and near-wisdom, inspirational humorist Debra Coty addresses heart needs of women who feel lost and alone in this great big world. In Too Loved to Be Lost, women will find simple, practical steps for healing, refreshment, and revitalization of spirit, body, and faith. Whether you’re struggling with issues related to trust, depression, patience, relationships, hurts, or hopes. . .this humor-filled volume will deliver a much-needed smile and equip you with simple-to-implement tips for attaining the kind of guidance and belonging you crave—the kind that can only be found in the unconditional love of Papa God. When I was in High School we had a disciplinarian Vice-Principal who, when he caught you misbehaving, could actually strike you with the palm of his hand. Everyone was scared of him. Then one day I went with a friend of mine to his office to let him know of my cousin who had graduated. My friend waited outside the door terrified. While I was in the office he laughed and was very friendly and when I came out my friend was in shock. Neither of us didn’t think it was possible. For some of us that is the way we see God. We do not think it possible that He will laugh with us, be friendly, listen to us or even love us. Ms. Coty wants to change all of that. In four sections, “Where Am I Going? Can I Get There From Here?”, “Can Anyone Really Refold Maps?, “Whoohoo! Road Trip!” and “The Destination Is My Journey” Ms. Coty gives us a new perspective asbout love by looking at feeling cherished, gaining confidence and curbing anxiety. Each chapter ends with a “Following My Personal GPS (God-Powered Satellite)” set of questions that let the reader ponder the answers and apply them to themselves. Not only is this a great book for us to read, sometimes many, many times, it is also a great gift for our friends and family. In Too Loved to Be Lost, you'll find simple, practical steps for healing, refreshment, and revitalization of spirit, body, and faith. Whether you're struggling with issues related to trust, depression, patience, relationships, hurts, or hopes. . .this humor-filled volume will deliver a much-needed smile and equip you with simple-to-implement tips for attaining the kind of guidance and belonging you crave—the kind that can only be found in the unconditional love of Papa God. Debora M. Coty is a popular speaker, columnist, lifelong Bible student, internationally published freelance writer, and award-winning author of numerous books, including Too Blessed to Be Stressed, and More Beauty, Less Beast. She’s also an orthopedic occupational therapist, writing instructor, and tennis addict. Mother of two grown children, Debora lives and loves in central Florida with her husband, Chuck, and desperately wicked pooch, Fenway. Too Loved to be Lost, is a great, little book that can be used as an encouragement to help remind us to not forget the enormous love that comes from our Father, no matter where or who we are. The author has provided many things from her own experiences that will either have you laughing or in tears because you can, so relate. You could possibly use this book as a devotional or maybe an in depth study. There are four sections and a total of 24 chapters. At the end of each chapter there are some simple question&thoughts to help you ponder the material. If you are in need of healing and inspiration then this is the book for you. I especially loved the story of the author getting lost when she was in Scotland. She lets us know quickly that she has the same fears we do and she shows us how God came to her rescue. She also tells us that we can expect the same treatment from Him. An encouraging book with love as its theme! A great book and a quick read! TOO LOVED TO BE LOST is a devotional for women to help encourage them in their day-to-day walk with the Lord. One of the devotionals was about insecurity and not being a part of the in-crowd. We all face that at times. You may be Ms. Popular at one location, but go to another and your on the fringes. And every place has its cliques,m whether it is work, church, school, conferences, or somewhere else. There was also a devotional about getting lost in Scotland and another party of her tour group c TOO LOVED TO BE LOST is a devotional for women to help encourage them in their day-to-day walk with the Lord. One of the devotionals was about insecurity and not being a part of the in-crowd. We all face that at times. You may be Ms. Popular at one location, but go to another and your on the fringes. And every place has its cliques,m whether it is work, church, school, conferences, or somewhere else. There was also a devotional about getting lost in Scotland and another party of her tour group came by and helped her find the hotel again. All the devotionals are filled with humor, scripture, and relate to something that w are either going through or will go through. They are also filled with wisdom and packed with God's love. I am reviewing the paperback copy of Too Loved to Be Lost: Discovering God's Intentional, Unconditional, Without-Limits Love by Debora M. Coty. It is a humourous instruction book for women for assistance and guidance with all of the issues we women face daily. Section 1: Where Am I Going? Can I Get There From Here? Section 2: Can Anyone Really Refold Maps? Section 3: Woohoo! Road Trip! In each section there are 6 chapters. For example, Chapter 13: I am reviewing the paperback copy of Too Loved to Be Lost: Discovering God's Intentional, Unconditional, Without-Limits Love by Debora M. Coty. It is a humourous instruction book for women for assistance and guidance with all of the issues we women face daily. In each section there are 6 chapters. For example, Chapter 13: Backseat Driving (Relinquishing Control) is one of the things that I always need to conquer. As each chapter does, it starts off with a bible verse. In this case it is Ephesians 3.20-21. Then a short story and devotional about the importance of relinquishing the control of our lives to God. Or Papa God as Debora Coty refers to God. "Too Loved to be Lost" is a wonderful, inspirational book by Debra Coty. It's about "discovering God's intentional, unconditional, without-limits love." There are 24 chapters to this book/4 main sections and at the end of each chapter she asks questions and gives you room to write your notes in the book. I love that it says right in chapter 1 that "God's unconditional love is: Forever faithfulness. Limitless loyalty. Enduring allegiance, Eternal devotion. Spiritual security." 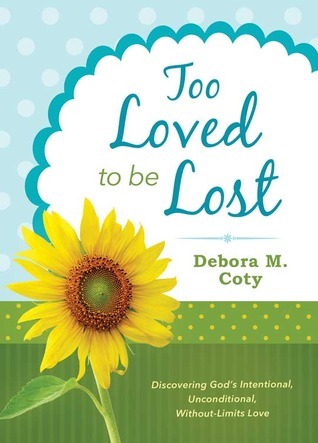 Isn't that beautiful "Too Loved to be Lost" is a wonderful, inspirational book by Debra Coty. It's about "discovering God's intentional, unconditional, without-limits love." There are 24 chapters to this book/4 main sections and at the end of each chapter she asks questions and gives you room to write your notes in the book. I love that it says right in chapter 1 that "God's unconditional love is: Forever faithfulness. Limitless loyalty. Enduring allegiance, Eternal devotion. Spiritual security." Isn't that beautiful and so true? She shares stories, examples and scriptures thru out the book. It's a wonderful book that will make you laugh, but is also thought provoking and addresses life principles we should be following (like love, forgiveness and discernment). This would make a great gift for a teacher, coworker, friend or yourself! I plan on keeping this book on my nightstand to read often! What a refreshing read!!! This is mixed with humor and so much wisdom in little nuggets of truth. Stories mixed with humor and truth that runs deep. How do I see myself? Do I see myself as an outsider or insider? Debora does a wonderful job of telling stories mixed with nuggets of truth and even easy to learn monthly scripture memorization called "Lifesavers". This is not a self-help book, but to me it is a self-reflection book. It emphasizes the fact that I am loved by God even when I don't fee What a refreshing read!!! This is mixed with humor and so much wisdom in little nuggets of truth. Stories mixed with humor and truth that runs deep. How do I see myself? Do I see myself as an outsider or insider? Debora does a wonderful job of telling stories mixed with nuggets of truth and even easy to learn monthly scripture memorization called "Lifesavers". This is not a self-help book, but to me it is a self-reflection book. It emphasizes the fact that I am loved by God even when I don't feel loved or lovable. God loves me unconditionally and just as I am no strings attached. This has been so much needed for me in the time that I needed it most. Too Loved to Be Lost is such a refreshment! I loved the humor Debera wrote with as well as all of her tips, "call-to-actions", and personal stories. The chapters were the perfect size, not too long so you don't get overwhelmed, but not so short that you don't feel like you read anything. I loved the colors of the book, the outline, everything about this book was amazing and I thoroughly enjoyed reading it! I have nothing negative to say about it! It comes highly recommended to women of all ages! Too Loved to Be Lost is such a refreshment! I loved the humor Debera wrote with as well as all of her tips, "call-to-actions", and personal stories. The chapters were the perfect size, not too long so you don't get overwhelmed, but not so short that you don't feel like you read anything. I loved the colors of the book, the outline, everything about this book was amazing and I thoroughly enjoyed reading it! I have nothing negative to say about it! It comes highly recommended to women of all ages! 5 stars! "I received this book from the author/publisher for the purpose of this review. All comments and opinions are my own." This book is an excellent read. I am so glad that I had the privilege to review it. struggling with some personal issues. for me. This book is very well written. I highly recommend it. Get your copy today. Too Love to be Lost is an amazing book! I have been reading one or two chapters a day, almost like a devotional. Debrah Coty does an amazing job of fusing serious situations with every day humor and genuine answers. I love her teaches and really enjoyed her writing style! She makes you think about what you believe and why you believe it. I would recommend this to so many people. Young, old, depressed, driven and anything in between because we all can benefit from this book! I found Too Loved to be Lost full of useful information. It's an easy read, very conversational. Sometimes it seemed almost too casual, even irreverent, when talking about God the Father. I imagine that just has to do with my upbringing and my preference. Still, I think I'll be sharing it with my daughter. In true tradition of Debora Coty books, this one was inspiring and emotionally healing. I always enjoy Debora's books and look forward to reading more in the future.